The Smiling Eggplant: Nepetella, che confusione! I'm a great lover of herbs, so when I was reading La Repubblica this morning and a certain Chef Rubio named nepetella as one of his favorite ingredients, I immediately sought to clarify its identity. I ended up doing major research- confusion reigns supreme, even among Italians. In these cases, I always think that the botanical name is your friend. But there is still no consensus on this weighty matter. As if this weren't bad enough, there are all sorts of regional names for these herbs. The confusion continues with the terms menta romana or mentuccia romana. Nepetella is in fact associated with Roman cooking, as in the recipe for Roman-style artichokes (not to be confused with artichokes alla giudia, also from Rome- its Jewish tradition). It is also good with mushrooms, especially porcini. However you call it, nepetella is not easy to find in the States, although seeds can be obtained. 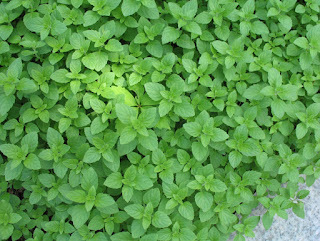 The herb is said to be a cross between oregano and mint, and English-language recipes will often substitute other herbs for it. Even many Italian recipes do this. Eager to try nepetella in a recipe? Here is Williams-Sonoma's take on Roman-style artichokes. And below you will find a photo of what is (probably) nepetella. I'm sure it's not catnip.